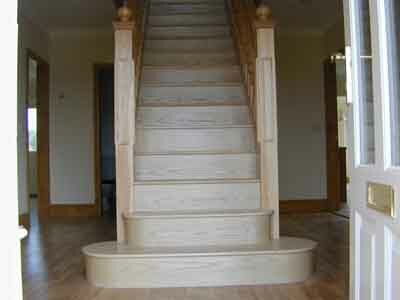 Fleetman Construction, Bespoke Staircase Pictures in Hardwood & Softwood. 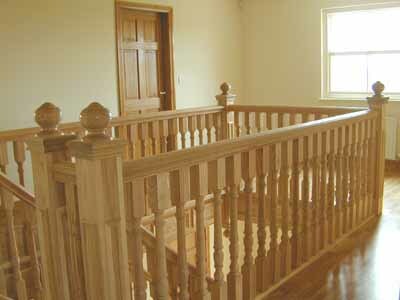 Fleetman Construction can provide a staircase to your own specification in either Hardwood or Softwood with a choice of spindles and newel posts, including boxed and panelled newels, fluted newels and spindles or a wide choice of turned newels and spindles. With have supplied and fitted many flights of stairs in the Newark & Lincoln area and also offer a unique spray finishing service from Fleetman Constructions team of decorators. Looking down on the Bespoke Ash staircase in a main hall, also showing purpose made oak glazed doors by Fleetman Construction with specialist ironmongery. 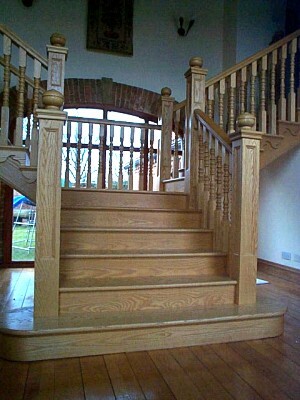 This Ash staircase has Panelled Newel posts with a wrap around bottom tread, complementing the cut and bracketed string. Behind the stairs, you can see a purpose made Douglas Fir window which has been fitted to suit the original opening in this barn conversion. This is an example of a pair of Ash staircases in a three storey house built by Fleetman Construction in a Lincolnshire village. 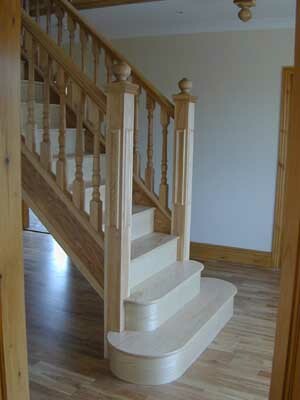 This is an example of a pair of Ash staircases in a three storey house built by Fleetman Construction in a Lincolnshire village. 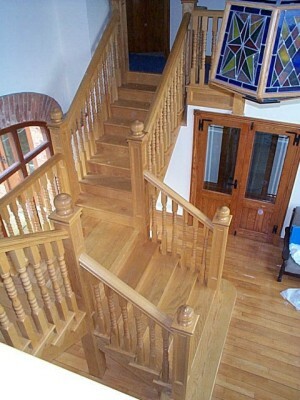 A traditional quarter landing on this Stained Piranha Pine and Hemlock Staircase in Nottinghamshire. This Landing creates an impressive area with room under the window for a seating area & Library using panelled Newel posts and a 52mm turned spindle. Front door opening into the hall with another Ash staircase in Nottinghamshire. Staircase viewed from the side showing the detail on the newel posts and the double bullnosed bottom treads in Nottinghamshire.